We asked our SAO Instructors what inspired them to follow a career in astronomy. Here are their responses. Alan Duffy (Credit: CAASTRO) Growing up in a small country town in Northern Ireland meant I got great views of the night sky (although not as good as Down Under!) and even at a young age I would always ask what those points of light were. Together with early exposure to SciFi greats like Asimov & Clarke, scientists such as Hawking & Feynman and of course shows such as Star Trek & Doctor Who the list of amazing things (time travel, black holes, space travel, the list goes on) I would ask questions about just continued to grow. Asking questions is habit forming, and before I knew it, I was studying physics in Manchester asking questions about every topic I could take as a course. It was only when I was told that you could weigh some of the smallest particles in nature (neutrinos) with the positions of the biggest objects in the Universe (galaxies) that I found my way back to astronomy via a PhD in cosmology. It's still a dream to me that a job such as mine exists where I get to keep asking questions of the Universe and have the resources to get the answers. I do not remember the first time I showed my interest in astronomy. According to my mother when I started school at 5 years old, I was already interested in whatever was shining there high in the sky, and at 9 years old I said to everybody that I wanted to study "like Galileo"! That was the beginning of the '80s, and it was difficult for many people to take seriously the plans of a such young girl. In that period, there were few women in astronomy. But astronomy was my passion, and step by step I carried on my dream and love for stars, making astronomy my profession. A profession which brought me around the world, and which allows me to learn new things, and meet interesting people day by day. 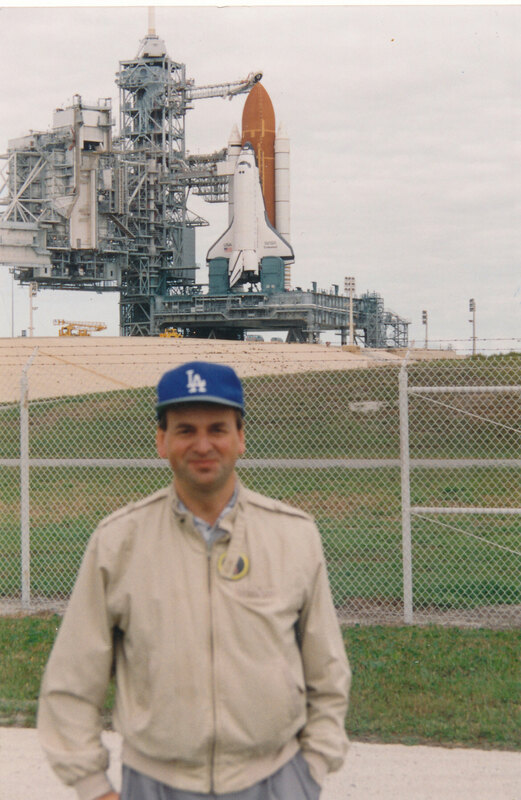 Jeremy at the Cape with the shuttle Endeavour prior to STS-61. (Credit: J. Mould) I became a space scientist in 1991 when I got a phone call from John Trauger of NASA JPL, asking me to join the WFPC2 camera team building the camera to fix the Hubble Space Telescope's primary mirror aberration. After Hubble Servicing Mission 1 (STS-61, now commemorated in an IMAX movie) over the following decade the team used WFPC2 to study everything from Saturn's aurora to the Eagle Nebula. Another team formed by myself and the late Marc Aaronson used WFPC2 to measure the Hubble Constant and the age of the Universe to 10% accuracy. So I had been interested in science since I was in middle school, but I can point to one specific moment that got me into astronomy. That was in high school when two astronomers came to my small town in northern Alberta with telescopes and a mobile planetarium. Once I saw Saturn through a telescope for the first time, and talked with the astronomers, I got hooked. I remember spending many nights that summer gazing up at the sky. I think I was also inspired by the dark skies and northern lights. 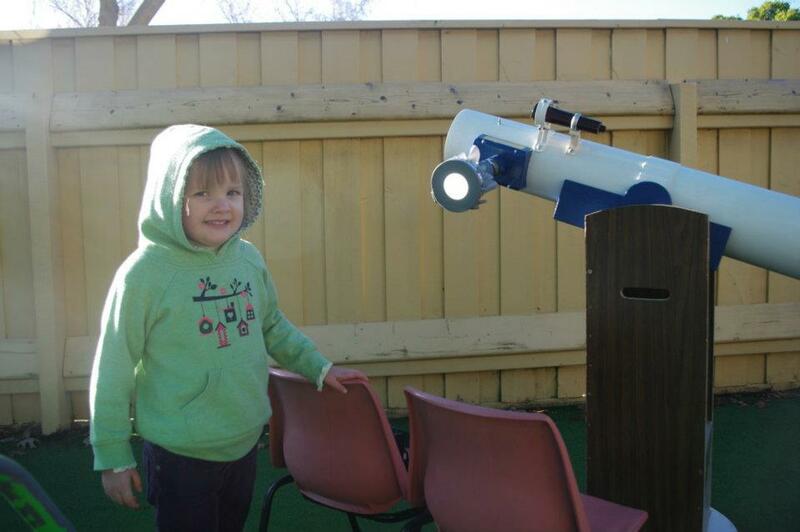 Emma's daughter Claire viewing the transit of Venus, 2012. (Credit: E. Ryan-Weber) As a ten year-old I was inspired by my Dad, he took me to our local Ballarat Observatory to see Halley's Comet in 1986. I then joined the Ballarat Astronomical Society and made a 10-cm Newtonian reflector. I still have this telescope and enthusiastically take it to Kindergartens and Schools to inspire the next generation. I liked all sciences and maths in school, so I was pretty interested in just about everything. Dissecting a frog turned me off the "wet" sciences, and I thought astronomy was pretty amazing after learning in maths class that you could describe the orbits of planets around the Sun with two very simple equations, and learning in chemistry that all elements in the periodic tables (besides H and He) were made in stars. When I went to university I still wasn't sure which science to major in. I really enjoyed palaeontology and geophysics for a while, but continued on with applied maths. By the time I was in the final year of my Bachelors, I was doing all the astrophysics and meteorology units offered in maths. When it came to my honours year, I finally had to choose between meteorology and astrophysics. A friend said to me, "Well if you do meteorology, people will always blame you for the bad weather", so astrophysics it was! I certainly watched Cosmos, but that was when I was a bit older. 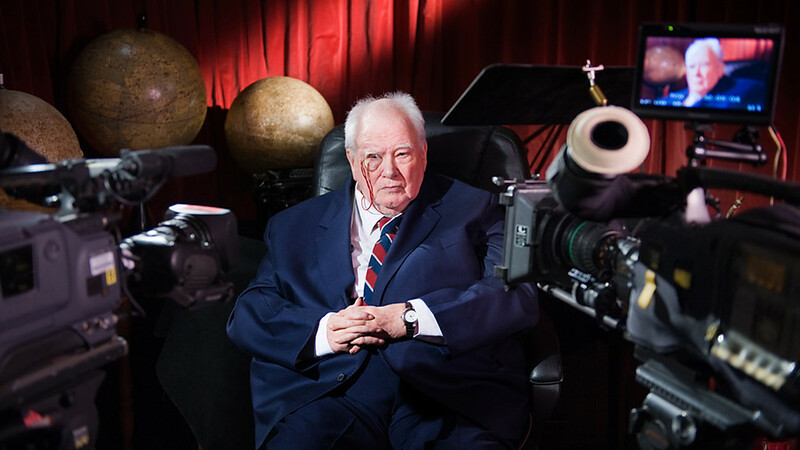 I think what really fired up my enthusiasm for all things space-related was the BBC TV programme The Sky At Night with Sir Patrick Moore. They used to show it once a month at midnight and I used to sit up with my Dad to find out about the latest astronomy news. 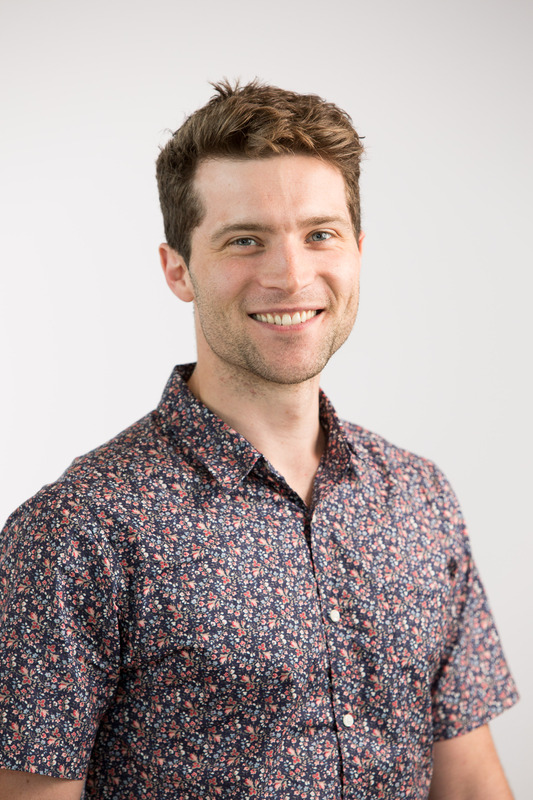 Patrick would usually have some fairly strange academic in a corduroy jacket (yes, with elbow patches) talking about some seemingly obscure, but utterly fascinating phenomena. I can still remember first hearing the amazingly cool term "quasar" on that programme. I could never understand why such an interesting show got such bad scheduling. TV science has come a long way! Favourite book: as a teenager, Freeman Dyson's books. Later at Princeton we had a few chats at lunch! Favourite film: War of the Worlds (1953 version). Those spaceships! Those green rays! ALBUM: Bartok Concerto for Orchestra! Georg Solti! How it all began: I was inspired to get into astronomy by talking by total accident while an undergraduate to a fellow at Bruce Hall (live-in college at ANU) who was a student at Mt Stromlo Observatory, found out that it was possible to be a professional astronomer, and that ANU had one of the best places in the business. Comet Halley, Dec. 1985. (Credit: © AAO, David Malin 1985-2010 I grew up on the outskirts of Ballarat - the skies are amazingly clear up there, and I spent many nights lying outside on my friend's trampoline looking at the stars and chatting - this was the beginning of my love of astronomy. I remember my dad waking me up in the middle of the night to show me a lunar eclipse, and meteor showers, and in 1986 we saw Comet Halley. However, I had no idea you could actually be paid to be an astronomer, and spent my high school years planning on being a "nuclear physicist", whatever that might be. When I got to university, and found out I could study astronomy... and then even get paid to do a PhD in the subject I was hooked. I am still amazed I earn a living doing my hobby! I'm passionate about astronomy outreach, and have worked in the Melbourne H. V. McKay Planetarium, was a tour guide for the Melbourne observatory, and I now give 3D astrotours at Swinburne to school kids. My interest in space and astronomy began at an early age, and was a combination of a number of factors. Three particularly profound events stand out in my memory: Christmas 1978, when my parents gave me some toys from a little movie called "Star Wars"; Carl Sagan's "Cosmos" television series in the early 1980s; and a trip to the original H.V.McKay Planetarium at the Melbourne Museum a few years before the most recent return of Halley's Comet. It was this last event that made me realise you could get actually get paid for looking at the night sky! Add in "Doctor Who", "Battlestar Galactica "and various other science fiction television shows, "The Hitch-Hikers Guide to the Galaxy" trilogy (in an increasing number of parts), visits to the Old Melbourne Observatory, early attempts at astrophotography with my father's SLR camera, writing simple astronomy programs on the family's TSR-80 colour computer, and a couple of research projects on "Mars" and "Saturn" at high school - and it was inevitable that I would go on to study...Software Engineering as part of a double degree at Melbourne University. After this brief detour, I returned my attention solely to Physics, completing my Honours year and PhD at the University of Melbourne (1999), before joining the new-born Centre for Astrophysics & Supercomputing at Swinburne University. The Universe - LIFE Nature Library In some ways it was a random walk, in other ways I seemed to be drawn towards astronomy. 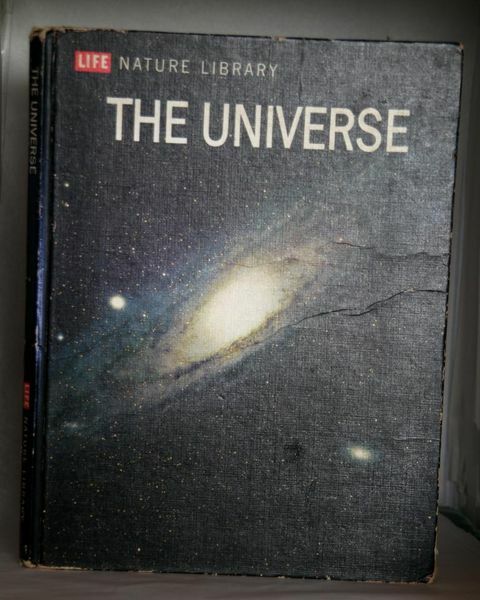 As a child I spent hours reading the LIFE Nature Library "The Universe" book, with M31 on the cover (and avoided the "Evolution" text in the same series - the red crab and Iguana(?) on its cover couldn't match Andromeda!). I constantly got into really deep thinking of what lay outside of the furthest galaxy, but of course just ended up quite confused. No doubt the neighbours were worried about the young lad lying on his back looking upwards with binoculars. As a teenager I built a Newtonian reflector and ground the primary mirror - not well - but I think at this stage the random walk was evaporating. I joined the Astronomical Society of Victoria briefly, then somehow finished a Bachelor of Science at the University of Melbourne and discovered (devoured) astrophysics in my Honours year. One of the staff, Graham Sargood, enthralled me with nuclear cross sections and reaction rates and descriptions of his visits to the Kellogg Radiation Lab. at CalTech and working with (Nobel winner) Willy Fowler. I decided working nights in the Physics basement Accelerator lab. at U. Melbourne was not for me, and I was lucky that Prof. Don Mathewson of ANU offered me a Ph.D. scholarship at Mt Stromlo and Siding Spring Observatories, ... so working nights it was! The 13" Dob in Year 12. (Credit: T. Bourke) My interested started in 3rd grade, when I was 8 years old. I did a science project on the planets, and found a great little book in our school library. At that time I decided I wanted to be an astronomer. Being in the path of a solar eclipse in 1976 sure didn't hurt that desire! About the same time we took a family trip from Wangaratta to Mackay, QLD, via the inland route. We stopped at Parkes, and also saw the AAT from the Newell highway further along (I don't think we took the detour to actually visit it). I had a poster of the Dish on my wall for many years after that! 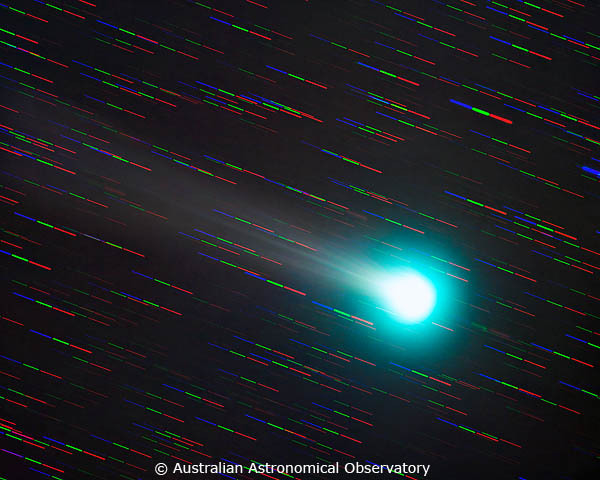 Nothing further happened until members of the Albury-Wodonga astronomical society came down to Wangaratta with their telescopes for an evening run through the local Continuing Education Centre. Looking at the planets etc through their scopes kick started my interest, as did my introduction to the magazines Sky & Telescope, and Astronomy. 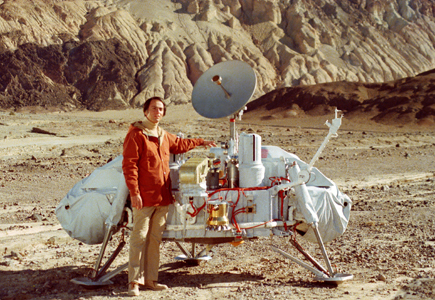 Not long after Cosmos appeared on TV. 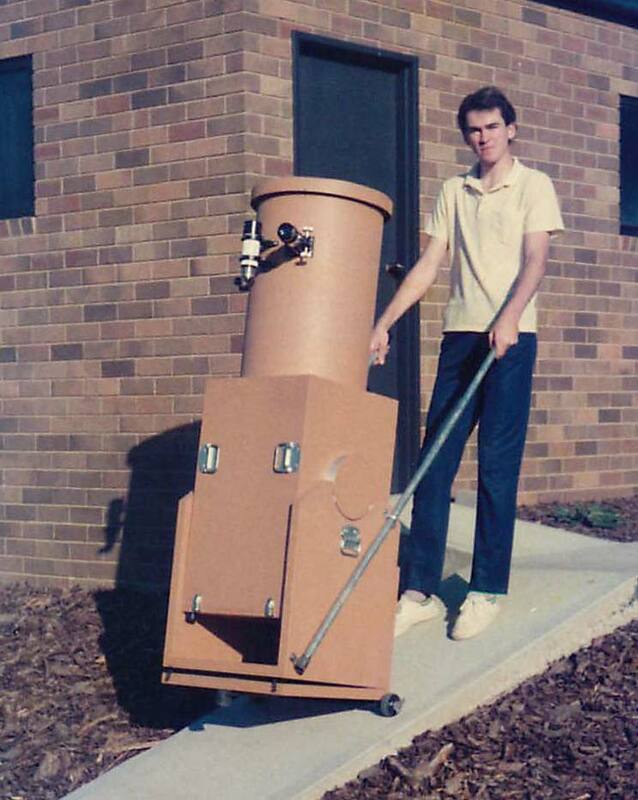 By that time I had joined the Albury-Wodonga astronomy group, and inspired by the new Dobsonian mounts, my Dad and I build our own 13" Dob, following very closely the plan in Richard Berry's little book (Dad is a carpenter, so that helped!). We bought the mirror from Coulter in the U.S. (it arrived in bubble wrap in a *cardboard* box. Sheesh!). I used the scope to observe Jupiter a lot and joined the Astronomical Society of Victoria, making the trek from Wang to the big smoke on numerous occasions for their meetings. Of course, the stars from country Victoria are fabulous. The 13" Dob is still there, rather lonely.